Ampthill turned on the style as they stormed to a 29-12 bonus point win against Wharfedale in the first ever meeting of the clubs at first XV level. Ampthill were on the front foot from the off , but two infringements and resulting penalties saw hosts Wharfedale take the lead with a fine unconverted try from inside centre Huw Morgan in the sixth minute. Despite the set-back, the Amps pack were in the ascendancy in the set piece, highlighted by a 16th minute 5m lineout catch & drive try from Viliami Ma’asi. Elliot Clements-Hill converted to begin a day of personal points accumulation. On 20 minutes Ampthill’s pack repeated the catch & drive process, with Ma’asi again touching down wide on the left, but Clements-Hill’s conversion attempt coming back off a post. Just three minutes later Amps were back in the home 22 with a 5m scrummage; half-back Barrett broke blind and fed Clements-Hill who crashed over by the corner flag, but his conversion attempt drifted wide. For much of the first quarter Wharfedale had been on the back foot but they responded with determination, keeping the ball for an extended period and forcing A’s to defend. However, a fine line break from centre Cameron Hudson finished with a loose pass snaffled by Clements-Hill outside his 22. The wing raced 70m to touch down under the posts in the 30th minute, securing the bonus point in the process, before converting his own try. The second half began with a fired up hosts taking play to Ampthill, and they were denied what looked to most observers a perfectly good try when scrum-half Harry Skelton picked up and dived over a breakdown on 49 minutes. Apparently, neither the referee nor his assistants had sight of the touchdown and a 5m scrum to ‘Dale was the result. To add insult to injury, Ampthill were soon back on the attack for Clements-Hill to seal a hat-trick in the 54th minute, finishing wide out and missing the conversion. 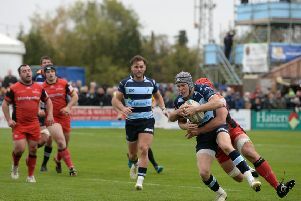 Despite the now seemingly impossible task of having to score four times, the home side continued to attack and were rewarded on 61 minutes by the game’s last try for openside Christopher Howick.